Even before man walked upright, we were consuming fruit that fermented naturally, as well as sampling all types of plants for their medicinal as well as narcotic properties. Probably the earliest fermentations were made from fruits and honey. About 12,000 years ago, humans began to settle into stable agrarian communities and gave up being hunter-gatherers that moved with the season to locate food. In order to feed a stable populace, we began cultivating grains — wheat, barley, and maize (corn). Probably the day after the first crop was hauled in, someone decided to try fermenting the grain to see what happened. The result, of course, was beer. 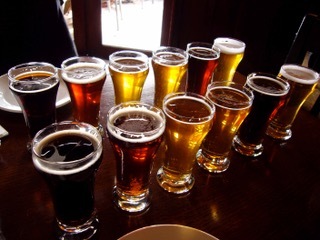 Beer, thanks to its fermentation and alcoholic content was generally safer to drink than the local water, which was often contaminated by both human and animal waste. As far back as Babylon and ancient Egypt, brewers experimented by adding all sorts of flavorings from other local produce – mandrake, dates, plums, olive oil and so on. It wasn’t until the Middle Ages that monks and others began adding hops to the mix, and so the more modern flavors of beer were born. Why add hops to beer? Prior to being an ingredient added to beer, hops were a naturally-growing bitter vegetable with medicinal qualities that are still used today. Hops have a relaxing quality to them due to a particular chemical in their makeup. They are anti-bacterial (used to treat wounds), antispasmodic (used to treat upset stomachs and menstrual cramps) and have been used to treat inflammation and as a sedative. What brewers discovered was that by adding hops to beer, the vegetable kept beer from going bad for a lot longer. Once the preservative resins in hops were identified, brewmasters went looking for hops with higher resin contents. Then growers began cross-breeding varieties to pull out specific qualities — American hops had three times more resin, while European hops were more floral. Cross-breeding created very floral hops with high resin contents. So today, beer is the most widely consumed alcoholic beverage and the third-most popular drink overall (after water and tea). Americans drank an estimated 6.3 billion gallons of beer last year, and New Hampshire led the nation in per capita consumption. President Jimmy Carter signed a bill that exempted from taxation beer brewed at home for personal or family use. That bill opened the door for today’s craft beer brewers. The more foam a beer has, the more flavorful it will be. Hops come from the Cannabaceae family (aka marijuana), although they aren’t interchangeable, not for lack of trying by brewers. The quality of the water used to make beer is key. Most breweries are located near clean, pure water sources to improve the quality of their brews. The Egyptian who built the pyramids were often paid in beer, and certainly consumed it before, during and after work, since it was safer to drink than water from the Nile. The average American consumes 28.3 gallons of beer last year. In 1814, 400,000 gallons of beer flooded the streets of London when a huge Vat in St. Giles ruptured. A study in the American Journal of Epidemiology noted that a bottle of beer consumed everyday reduces the risk of kidney stones by 40%. The strongest beer in the world (called Snake Venom) has a 67.5% alcohol content. As a general rule, darker, bitter beers have a higher alcohol content. For the true beer lover, you can swim in pools of beer in Austria, although we don’t recommend you drink from the pool. The oldest brewery is located in Germany and has been continually operating since 1040 AD.